Let’s look at some sources describing Bowie and Mexican knife fighting. The Bowie knife is known as a national symbol in the United States and abroad since the mid-1800s. The knife came to be used all over the world in very different formats but while its reputation was made as a fighting knife, very little material was left behind to understand how exactly people fought with such a weapon. It seems that as the popularity of revolvers gained ground, the practice of Bowie knife fencing dwindled and finally disappeared or at least mutated into something else. One of the first attempt to reconstruct Bowie knife dueling by two fencing instructors of New-Orleans. Orest Maykar of the New Orleans Federation of Fencing Clubs and James Janssen a saber expert of Les Chevaliers de la Nouvelle-Orléans (Knights of New Orleans). Both were interviewed for the Times Picayune New Orleans State on January 3rd 1937. A while ago I came upon an interesting article called “6 inches of steel” on a Californian named Louis Juan Ohnimus and his knife fighting skills. I wasn’t the first one to discover this article but it appears that this was probably one of the only historical documents on Bowie techniques. Unfortunately, the article is written in an interview format and without actually being there it can be hard to understand what exactly Ohnimus meant and so many techniques descriptions are rather cryptic. 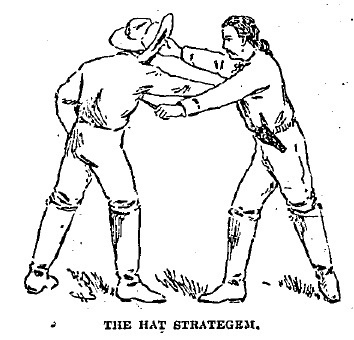 Not only that but while the techniques presented are very fine the article does not give enough details to reconstitute a completely workable style of knife fighting as too many unknowns remain. Throughout the text you can notice something very interesting; Ohnimus makes several mentions to Mexican techniques and goes on to praise the skills of his southern neighbors as being second to none. The image of Mexicans as fierce knife fighters was very strong in this time and perhaps not without good reasons. Knife fighting was itself very much popular in Spain and many settlers would have brought with them their ideas of honor and their own fighting techniques which would be changed in the context of the New World. Col. A.J. Drexel Biddle – former hand to hand training officer to the Marine Corps in the Second World War- himself commented how his first experience with knife fighting was while he lived in Spain with his parents: “You had to learn to stab your little friends or they stabbed you.” as he commented (Rockford Register Republic, March 27th, 1942). Some anecdotes seem to indicate that Mexican knife fighting had an influence on the Bowie system and that at some point they may have been one and the same. For example, this ad was published in 1865 to publicize the fencing lessons given in Centralia, Illinois, by a certain Captain Arthur de Pelgrom. De Pelgrom was a Belgian man who according to his ad served as the instructor general for the Potomac army during the American Civil War. The ad contains a list of what the captain taught to his pupils, which included some unique disciplines such as double sticks and Mexican dagger. It is unclear if de Pelgrom taught all of this to the soldiers, but it can be deduced that if so it would have been likely practiced with a Bowie. Whatever the nature of Bowie knife fighting the practice was slowly fading away and while Mexican knife fighting might very well still be alive somewhere today, we have very few sources to turn to. The image above was taken from an 1888 article called Cold Steel. Contrary to what might be expected from the title, this article covers very few details about the use of the Bowie and deals mostly in how to wear it and in anecdotes of famous fights or knife owners. They do cover a little bit about how to hold the knife correctly: “When the knife is out of the sheath and he forearm and wrist are turned outward, and the hand lowered to the waist. The weapon is held as one holds a sword, the thumb, and forefinger next to the hilt, not as the stage desperado holds his dagger. 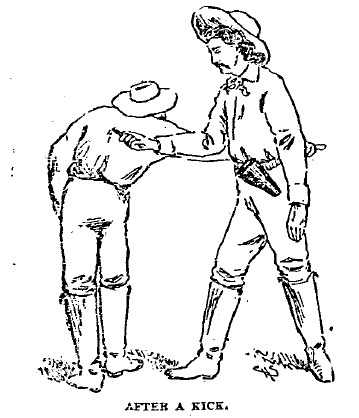 The edge is upward, and the weapon is used most effectively by making a forward thrust and then an upward rip.” It seems to hint at the use of the left hand for parrying while the defense against the pistol is exactly the same as the one mentioned below and the author also does not recommend throwing a knife. 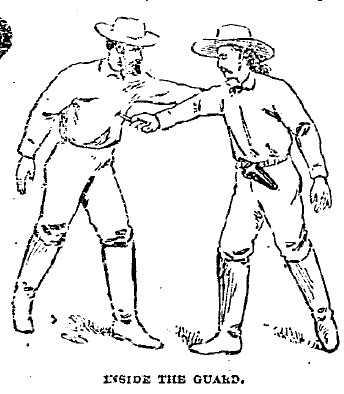 “Duels with knives” was published on December 10, 1893, by the Chicago tribune and presents to us for probably the first time in writing the technical basics of Mexican knife fighting. One of the first things you will notice is that most of the illustrations are virtually the same as the one of “6 inches of steel”. It could be because Ohnimus also authored this article, but on closer inspection it would seem unlikely. While some of the techniques are similar, Ohnimus mentions that one should be ready to throw his knife at his opponent whereas the present author explains why this is a very bad idea. The details about the Mexican guard are rather similar but the illustrations do not match the text and it rather seems as if the editor felt that some illustrations were needed and simply modified the ones from Ohnimus while adding the “wrong grasp” and the “Dixie knife” which also appears in other articles. In such a short text the author as he mentioned didn’t wanted to present the complete practice but managed to cover the basics reasonably well that we could recreate a simple fighting style while adding some of Ohnimus’ material. Positions described by a man who knows all about them. Not everyone in our country knows what a tricky science there is behind the use of the knife as a weapon of offense and defense, but let him travel away to the South or Southwest among the people browned by the sun and a new and deadly phase of the man-fighting art comes to the surface. Knife fighting seems generally to be a weakness of Southern denizens as well in the Old World as the new. South of Mason and Dixon’s line is this country it is no unusual thing even at this day to find a bad man who prides himself on his superior science with the thing, but to get into real knife territory one must go into the Mexican and South American countries. Here he will find desperadoes innumerable whose use of the knife for generations has evolved into a well defined science, as distinctly so almost as the use of the fists in this country by exponents of that art. The origin of true knife science is said to have been Andalusia, where its use was brought to great perfection. Hence in South America, when a native is particularly renowned as a deft wielder of the short blade, he is petted by his friends by being referred to as having sprung of true Andalusian stock. This science, as now practiced in this part of the world is much rougher than the Old Spanish style, being improved mostly along the line of bloodthirstiness from divers foul tricks and stratagems that gentlemen of the old school knew or cared to know nothing of. At one time the serape, or Spanish cloak, was used as a guard for the fighting arm, being wrapped about that member down as far as the knuckles of the hand during combat, which was especially useful in minimizing danger from side slashes to the arteries and veins of the wrist. But the precautionary serape does not obtain so much as formerly unless it be in showy affairs between gentlemen who like to pose in steel clashing until the duel can be interfered with by outsiders. The business-meaning “greaser” does not give his opponent time to get a cloak about him and does not often take the trouble himself, if he has one. In the knife duel the right side and arm are presented to the opponent, instead of the left, as in boxing, and the knife of the adversary is watched rather than his eyes. The left hand is used to guard with or grasp the opponent, if the chance offers, about his right wrist or other place, and is carried well open, high up toward the neck, and close to the body. 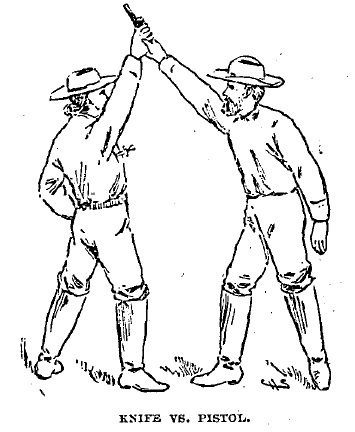 In case of getting the opponent by the wrist of his fighting arm with your left, if your grasp is strong and you are quick enough in taking advantage of the opening, the game is won, but if he is allowed to wrench away to his right or slip down and send both of his feet into your abdomen as you come after him nothing is gained, and perhaps you may be a loser from the transaction. It would be useless in an article as short as this to attempt to go into the art methodically and scientifically and would lack interest perhaps as well. Some of the main points and tricks, however, may be mentioned. The first requisite is holding the knife properly, which should be done in a way to get the longest and easiest possible reach from the instrument, being in a position to slash up or sidewise instead of down. This is brought about by grasping the knife so it points straight in front with the palm of the hand up. The stage villain invariably holds his dagger wrong, and a man who would go into actual battle that way with a scientific knife fighter would, even in case his opponent had no weapon of his own, stand chances of being killed from having his awkwardly held blade turned against him. As in boxing the feet play a big part in scientific knife sparring. The nimble side slips of the bull fighter are brought into play and no one in the world is quite so good as the Mexican at this part of the game. The old Spanish gentleman used to stand nearly erect in the knife duel and handle his instrument something after the manner of a sword, but the Spanish-American squats beyond dignity, whirls his blade in a circle from his nimble wrist to dazzle his adversary, and attempts in all manner of ways to alarm and unnerve his opponent for a safe opening. Mexicans fighting among themselves usually throw off the sombrero and sometimes mutually agree to the serape, but when a greaser gets into close-quarter fighting with white bordermen the sombrero is just what he wants. Circling about his adversary and getting him into a stiff, waiting guard, he will suddenly lash his big hat into the man’s face and have him disemboweled before he is aware of the stratagem. Then the foul kick for the stomach is a trick that makes the new world knife fighter altogether ahead of his Andalusian prototype for practical results. All fighting Mexicans or vaqueros wear boots with high tops and heels and heavy thick soles, with which one is liable to receive a ripping side kick under the guard at an unexpected moment. The way is paved for the foot blow by a series of continuous hoisting of the right knee during sparring. 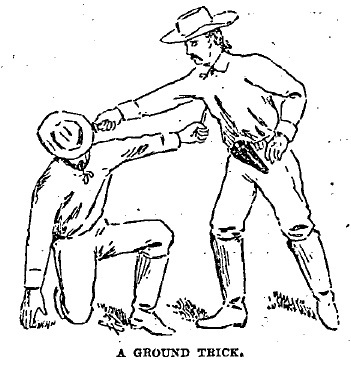 Another trick is when an adversary’s knife thrust is engaged to pin his right foot to the ground, disengage and stick him when he is catching his balance. The throwing of a knife, affected in practice by would-be bad youths of the North who have sought education in the dime novel, is useful only as a circus trick. The true knife fighter would no more think of risking his life by such a thing than the cowboy would take chances of braining an adversary by throwing his gun at him. A knife thrown at one is easily dodged as a club or other missile, and the party at whom it has been thrown may in most instances kill his enemy at leisure, having his man disarmed. As unreasonable as it may appear at first sight two duelists with the knife if they are well trained in the art, often consume a long time before the winner is determined. For some time most of the play is made for the adversary’s wrist or forearm by quick twirls of the blade to right or left, thus testing the wind and patience as in other combats. To take a full opening for the body is a great risk for the man making it unless the advantage is all his own. A deft side step or parry and he is in further than he can get out, and his opponent has him as his mercy. But with a tenderfoot no such precaution is necessary, and the Mexican who is lucky enough to scare such game prides himself on finishing the victim at a stroke or so. The short man, if he is well up in tactics and spry on his pins, carries the advantage over a taller adversary. The taller man has the better reach, but, as being able to get under the guard of an opponent is the most telling part of the game, the short and shifty fighter is accounted the lucky one. The most preferable parts for attack are the wrist of the opponent’s fighting arm, the abdomen, or, in between the shoulder blades. The head is the last point to think about. José Arguello, famed at one time as a knife fighter from Buenos Ayres to the Mexican Capital, killed many of his men by his agility in getting to the ground under his victim’s guard and reaching up for the stomach. He was short and bow-legged, and his particular delight when man-hungry was to pick a fight out of a tall adversary. He was a sort of Jem Mace in his way, in that his whole time and attention were given to his art, but unlike Jem his philosophy led him to believe that the best and easiest way to lick a man was to kill him. He never met his match with the knife, but one day a ball from a Winchester stopped him seventy-five yards short of a man he was about to interview. certainly looks different to what most people seem to be doing with their Bowies. I think between this article and the Ohimnus one, there is probably enough to start again with Bowie Knives and try for a reconstruction. Yes it’s a little bit reminiscent of old stuff like John Styers but still different. Actually the crouching made me think a lot about.. West Side story! I’d be curious to see who choreographed that! 😉 But for sure it looks like a solid non-nonsense system. Thanks for the good comments! I’m more interested in the twirling part. With a long enough blade, making constant circles works like a circular parry against hand cuts with the twirling action guiding the blade into the quillions. Definitely something to try out here. Hum, interesting I didn’t thought of it that way. Thanks for sharing your thoughts! I like the ol’ toss your hat in his face trick. If the primary objective of a violent encounter is to survive, I’ll use whatever dirty, cheap trick I can pull out in order to make it through in one piece.